Dillon (who is mooching, above, with Harvey out at night) has been here for 2 weeks and I thought it would be interesting to put up some comparisons of his hooves in and out of his wedged shoes. The problem is that its pretty difficult to get much of an idea of how his feet looked in shoes because the shoes were so all-enveloping. Nevertheless, here they are in wedges (above) and today (below). I'll upload some footage of him over the next few days but at the moment - as you can see - he has coped very well with increased movement and turnout and he has maintained his good landing, which is great. Interestingly, his base of support is in more or less the same place as it was in the wedges but his hoof pastern axis is better and his toes aren't sliding into the ground. "The horse seems to be going round in circles...Are you sure you're doing that right?" One of the things I've been doing more of over the last few months is putting horses on circles - not just as a test of soundness but as a way of regularly assessing how their comfort levels are improving. I've been planning since the end of last year also to film horses more often on a circle but its not practical in every case - if the weather is bad its impossible; if horses are totally wired when they arrive its not always safe or useful. I still like to grab the footage where I can, though - and the clips of Lenny, below illustrate why. Lenny on a circle from Nic Barker on Vimeo. I've put two short comparisons, about 2 weeks apart, on the footage; they show Lenny at 2 weeks after he arrived (when he had already changed from a toe first to heel first landing) and at 4 weeks. You can see that even though his landing had improved after his first fortnight here, he was noticeably less sound on the left rein on a circle and was inclined to rush. On the right rein everything was more level but unbalanced and he found a right bend difficult, so tended to fall in and make the circle even smaller. 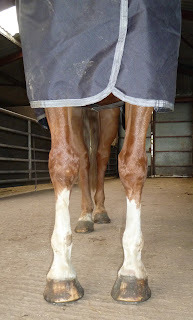 Just under 2 weeks later and he is much happier - he is more relaxed, more balanced and has more suppleness. Even though there is a long way to go, he is heading in the right direction. Over the next few weeks he should become better still and start to move with less hollowness as well. Lenny is a good illustration of how foot balance affects the whole horse. Even a small improvement in hoof landing and balance can have a big effect not only on the limbs but the rest of the horse - and his overall freedom of movement. Heresy on a Monday morning...or the Rockley version of reality. Its not gospel, its not written in stone, its not golden rules (except perhaps the last one) but its true nonetheless and may be worth considering. Hooves which look strange and are asymmetric can function better for some horses than hooves which appear "perfectly balanced" to the human eye. Many barefoot horses in work will benefit from not being trimmed every 6-8 weeks. This is particularly true if the farrier or trimmer is determined to "re-balance" the hoof or trims sole or frog. Celery is an extremely useful, though currently under-rated, trimming tool. Its not always applicable, but it can be a lot safer than the alternative. 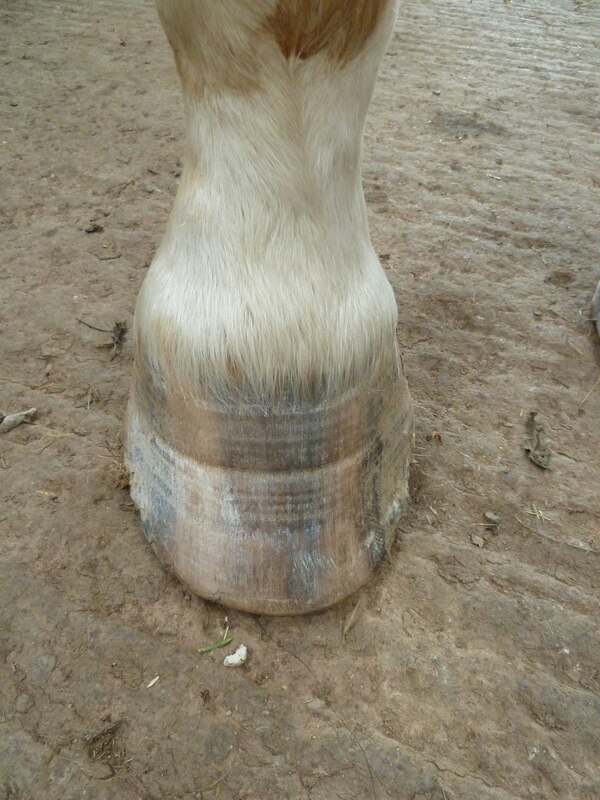 Hooves which are rapidly changing don't always benefit from trimming. 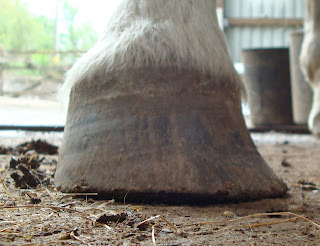 This horse, for instance, will continue to grow hoof at the new angle despite the long toe of his old hoof capsule. Backing up the toe would reduce leverage but put huge stress on his ligaments and is likely to make him much more uncomfortable. Infection in frogs need to be dealt with but aren't going to benefit from being carved out. The horse is not loading the area because its sore, so making it more sore isn't a solution - the frog needs more engagement, not less, if its to regain long term good health. You will never improve a horse's soundness by imposing your own ideas of foot balance or trimming to the detriment of the horse's comfort. Horses suffering from soreness after trims are just that - sore - its not a "post trim reaction", its an injury. Thats not a beneficial thing, its a mistake - and sometimes a serious mistake. The horse really does know more about his feet than you do - so LISTEN. I had a good day yesterday with one of the UKNHCP students, Nadia Meadows, who did one of her final Practical days with me. 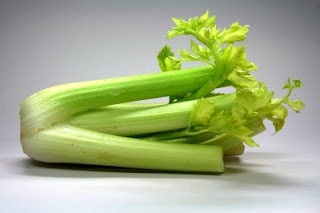 We spent a lot of time looking at horses and hooves (of course) and discussing why most wouldn't benefit from being trimmed ;-) I was delighted to discover that due to her experience with her own (and many other) horses Nadia has definite celery tendencies and I was only too happy to encourage them! While there was a spare pair of hands available I also took the opportunity to get some new footage of Flynn. If you remember, Flynn arrived with long toes and high heels and was clearly landing toe first in front and sliding his hind feet. Over the next month he progressed fairly rapidly to achieving a much better landing with his LF but his RF remained stubbornly toe first. This was to a large extent due to the fact that Flynn had developed a nasty split in the central sulcus of his frog which you can see in the photo above. This had become infected and sore over many months. 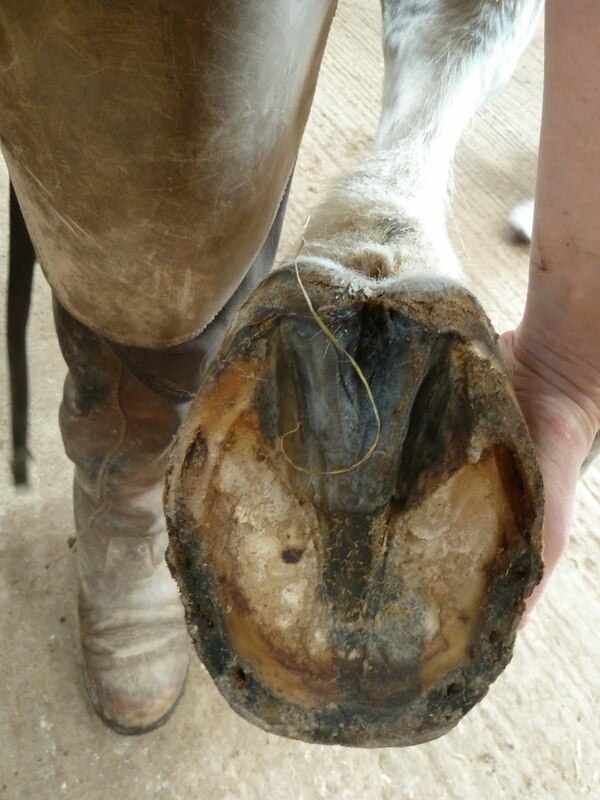 His owner was aware of it but its the sort of problem which can be stubborn and extremely difficult to get rid of, particularly when a horse is in shoes. Once out of shoes, a split like this can be painful enough to stop a horse landing heel first, and it certainly slowed Flynn's progress with that foot. Flynn comparison: 13th May-24th June from Nic Barker on Vimeo. Finally, though, a good few weeks after his LF had already changed and his overall stride length improved, Flynn is just beginning to land more correctly on the RF as well. He still has his medio-lateral balance to sort out, but he is growing in a straighter hoof. That update will be for another day! I put up new photos of Zan yesterday but because of all the problems I have had with my computer this week (long, boring story, may blog about that on a rainy day if there is nothing more interesting to tell you about...) I've not been able to update his footage till now. I don't have the hard copy of Zan's lameness assessment yet but when I spoke to his vet before he came down he described him as being 2/10 lame - the problem was bilateral but slightly worse on his RF. with this one of him today. 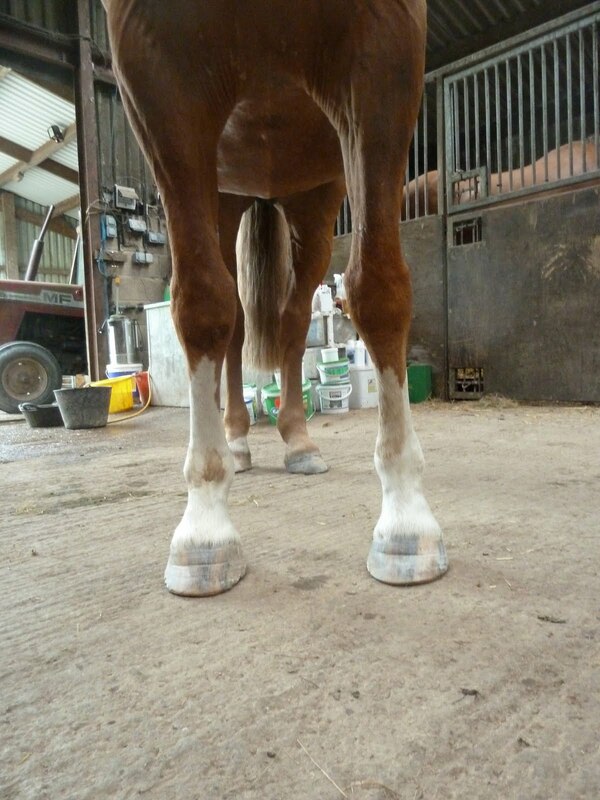 For practical purposes the massive changes in his hoof capsule mean that the hoof at ground level does not have the correct medio-lateral balance yet and has a long toe as well - for the moment - which also affects his movement. You therefore have to remember when you watch this clip that Zan's hooves (as with all rehab horses) are a "work in progress" and that his movement will improve again as the new hoof capsule continues to grow down. Zan on a circle from Nic Barker on Vimeo. 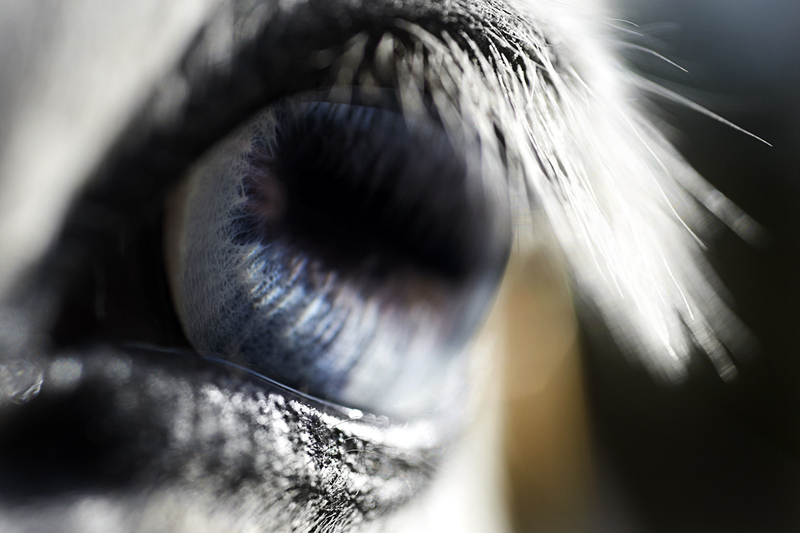 These hooves are just as extraordinary as they appear. They belong to Zan, a horse who arrived with the weakest, thinnest soles I've yet seen but who is growing in utterly different hooves. You can see from this shot that his "new" toe will be at least an inch shorter but the most astonishing shot is from the sole. From here you can see (and in real life feel) how much further back his breakover will be when the new hoof capsule has grown in. The dark area on the left of the picture is old damage, and its about at the edge of that where the new breakover will be. For comparison, here is the same foot, below, just out of shoes. Totally different proportions, breakover and loading - and the changes are not a result of trimming. And finally, a quick comparison of the caudal hoof in bar shoes on arrival and now. 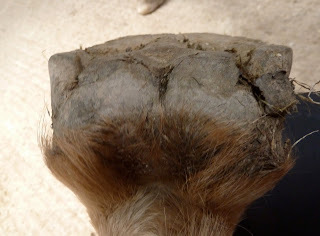 If you ever hear someone say that their horse has thin soles - like its a problem they are stuck with - please show them these photos. 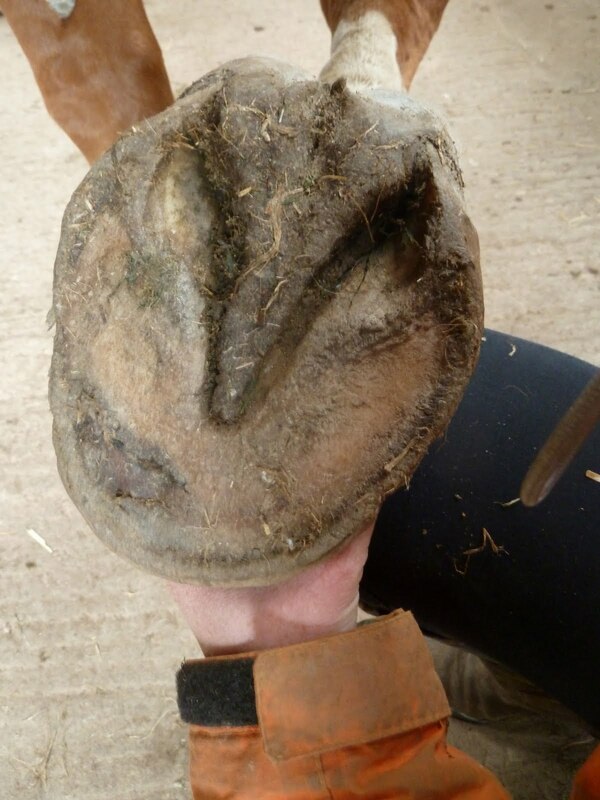 No horse likes to have thin soles and most horses will grow a fantastically improved, tougher, stronger, thicker, more robust, healthier, well balanced, sounder hoof if you give them the chance. I'm going to bang away again on subjects I keep coming back to and which are inextricably interlinked - movement, box rest and biomechanics. 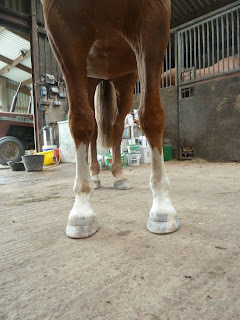 In the last year I've blogged here about why movement is vital - it is for any horse, but if you are expecting a horse to build a stronger, healthier hoof, its essential. One thing you CAN guarantee (which doesn't often happen with horses, admittedly!) is that no horse can build a truly healthy hoof without LOTS of miles, lots of stimulus and lots of varied terrain. 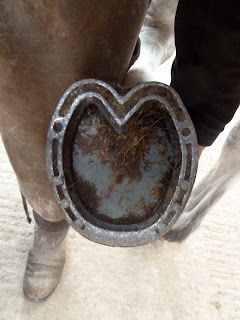 I've also blogged before about why box rest often doesn't work very well for horses with caudal heel pain or soft tissue injuries within the hoof. Without movement, horses become frustrated and stressed and their bodies become weak and compromised. 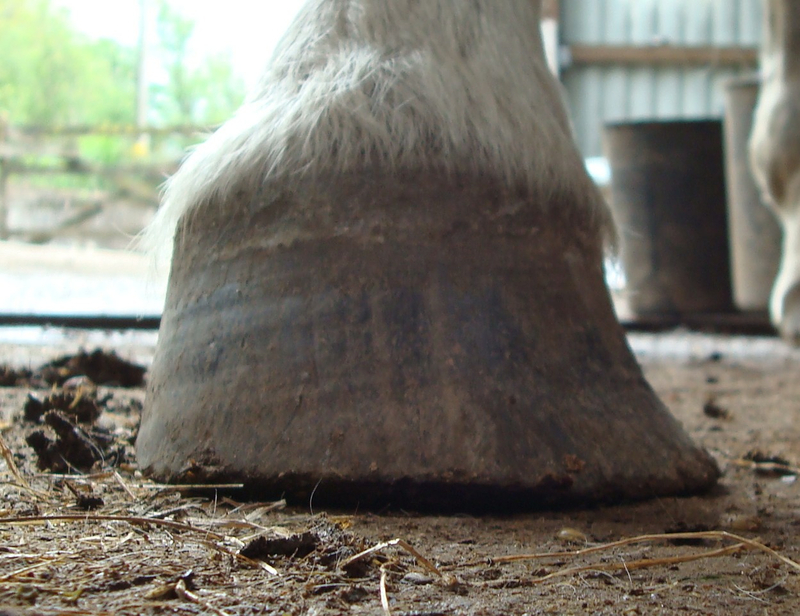 Hooves are no different, and although box rest can seem a tempting way to alleviate soft tissue damage within the hoof, it often causes a host of other problems. Its also fairly common - and distressing for both horse and owner - for a horse to come off a long period of box-rest following this type of injury and re-injure itself once it comes back into work - or even following turnout. In fact, for horses with DDFT or collateral ligament injuries within the hoof, the key to improved soundness seems to be not stopping movement altogether - but simply stopping the damaging movement. As a matter of interest, all the rehab horses pictured above were on box rest before they came to Rockley. For each of them, their level of movement was carefully increased over a few days after they arrived. The increase in movement was controlled, and - perhaps more importantly - the surfaces they were allowed to move on were controlled, but increased space and increased movement did NOT impair their soundness. In fact, I can't recall a single rehab horse who became lamer because of more space or more movement as long as it was correct movement. Over the years I've heard this said about lots of different horses - most of whom were already lame in shoes. It can mean different things to different people, and I've given my interpretations of a few occasions when it has been said either to me or to owners. This isn't conjecture, either - I knew the horses as well. "This horse can't go barefoot" = "I have aggressively trimmed this horse's sole and frog and have damaged its hooves sufficiently that it can no longer stand on a hard surface unless I put shoes and pads on its feet." "This horse can't go barefoot" = "I believe all I have been told about TBs and I have never seen how dynamic change in hooves can be. I also have limited understanding of the function of correct nutrition and biomechanics in building healthier hooves." "This horse can't go barefoot" = "I have never seen a healthy bare hoof, have never ridden a horse that wasn't shod and have no appreciation of how hard hooves can work over tough terrain and roads without shoes." As an alternative, sometimes with these same people "This horse can't go barefoot" = "I have no desire to change my ways or stop shoeing my horses because I can't see a problem with shoes, barefoot seems complicated and I don't really have the time or inclination to learn more." The horse with the wedges - continued! He has come here straight from box rest, thanks partly to the fact that he has an open-minded, interested, up-to-speed vet, partly due to the many fabulous barefooters and ex-Rockley-rehabbers who give their time, advice and support online, and mostly due (as with every single horse who comes here) to a phenomenally dedicated owner who has listened to her horse and refused to give up on him. Dillon went lame and was initially shod with wedges in January, which brought him very much sounder, but he went lame again as he came back into work and on MRI was diagnosed with bilateral DDFT damage, navicular damage and pedal osteitis. 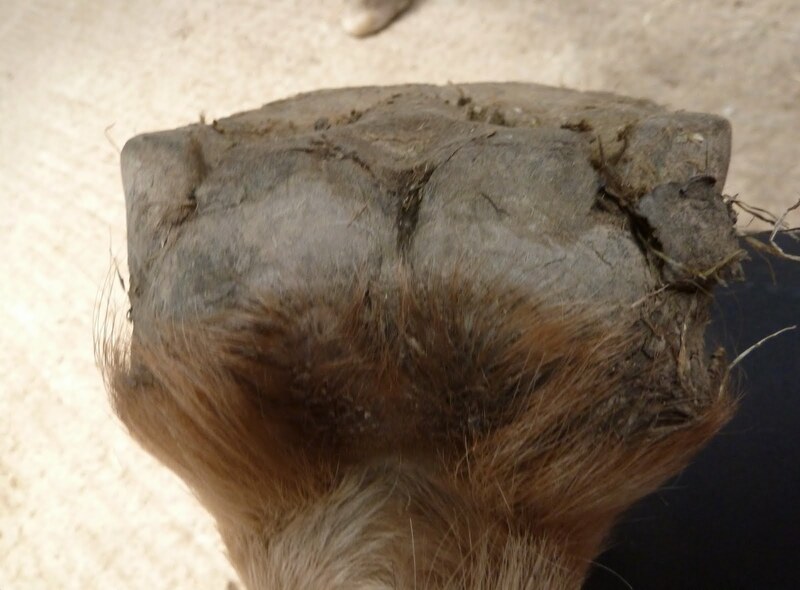 The wedges were supposed to improve the hoof/pastern axis and at the time perhaps they did, but if you compare him in the wedges now and straight out of them - even with an extremely weak caudal hoof - its debatable whether they are currently making much difference. However a second reason for the wedges was to take pressure off the DDFT. This was successful in the short term as one good thing they achieved was a very pronounced heel first landing, whereas its probable (but not certain) that he was landing toe first when he originally went lame. The problem is that reliance on the bar shoe and pad has led to an even weaker caudal hoof as well as to reduced proprioception. 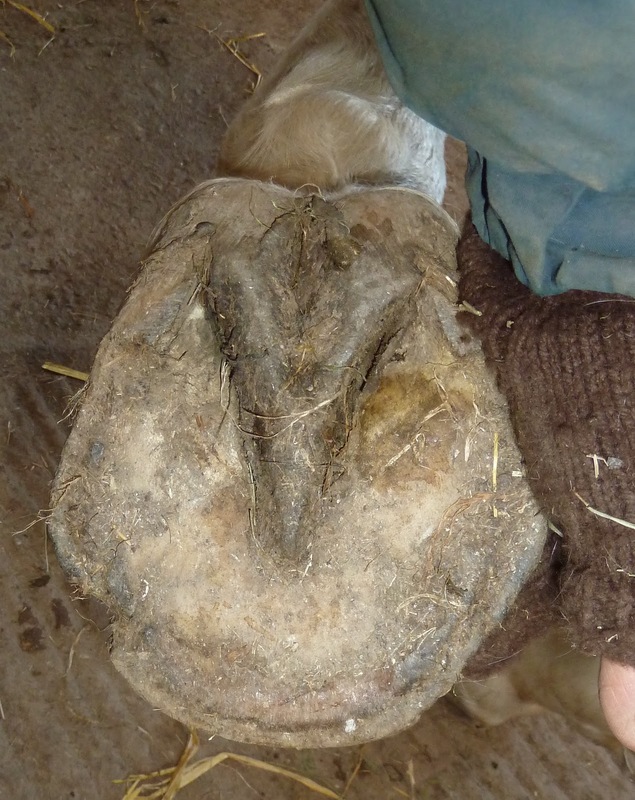 Like many remedial shoeing options, its given some short term protection but hasn't solved the underlying problem and has weakened, rather than strengthened, the hoof. Although this photo was taken on a slant you can see that the lateral cartilages are pinched in and that the digital cushion is weak. There also appears to be a heel imbalance but that doesn't worry me unduly as it will probably correct as the heels de-contract. This is the weaker foot (LF) straight out of the shoe, wedge and pad. There will be lots more on Dillon over the next few weeks. I put Lenny's photos up yesterday and to my mind, he has a healthier and more robust caudal hoof already than he had when he arrived. The test though is always in how horses are moving, and finally (after some really annoying glitches with my Mac which have had me wanting to throw it out of the window) I've managed to upload it. Lenny has changed his landing quicker than some horses, but he had a reasonably good frog and digital cushion which is always a help. Lenny - comparison from 31st May to 16th June from Nic Barker on Vimeo. His landing has improved but his stride has shortened - this is a common but temporary issue, due partly to the fact that he doesn't yet have the best shock absorption and partly due to the changed way in which he is using himself now, as opposed to 3 weeks ago. There is lots of work to do but he's made a good start. Lenny arrived nearly 3 weeks ago and its high time I posted updates on his feet. I've got footage as well but a computer glitch is holding me up getting that online. unfortunately. Lenny arrived in bar shoes and as you can see from the nail holes, his hooves are already growing at a reasonably increased rate. The two photos above and below show him on the day he arrived. The photo below show him today - the toe clip is disappearing and the nail holes have also grown down well. What is interesting is that bar shoes are usually recommended in these types of cases because of the "support" they are supposed to provide for the heels and caudal hoof. But because Lenny already had a fairly healthy digital cushion and frog, his hoof-pastern axis is unchanged by shoes. On the basis of these photos you can also see that his frogs, heels and caudal hoof have actually become stronger since he started rehab without shoes and on supportive surfaces. ...and there will be more to come over the weekend! Had lots for the blog today but not enough time to put it on! I've got updated footage of Lenny to come, plus photos of a new horse, Dillon, who arrived yesterday. I WILL get them up here but probably not till later today or over the weekend...! Sharp-eyed blog readers will already have noticed that another horse has returned to Rockley. This time its none other than Mr Dexterity - Dexter himself, the horse who inspired the "Project Dexter" research! As you can see, he is looking magnificent and is on tremendously good form, apart from being deeply unimpressed with the current wet weather (and this slightly too big headcollar...). He has come back here because Kelly has had to move to London where she now has a literally high-flying new job with BA and gorgeous though Dex is, he wouldn't make cabin crew. It took no time at all for Dex to catch up with his old pals - though as he's only been here during the hunting season previously, I think he was surprised to see Charlie looking quite so feral(!). He has been hard at work for the best part of the last 3 weeks because he is a lovely, well-mannered horse to ride and is also good to lead other horses from. 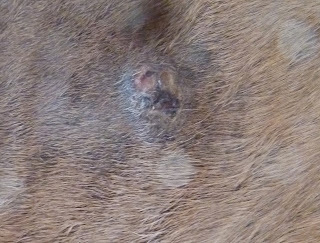 Its been known for a long time that clues to mineral levels - whether adequate or inadequate - can often be seen in horses in the most obvious areas - particularly skin, coat and hooves. We all admire a glossy coat as a sign of good health and for those of us with barefoot horses, rock-crunching feet are another indicator. 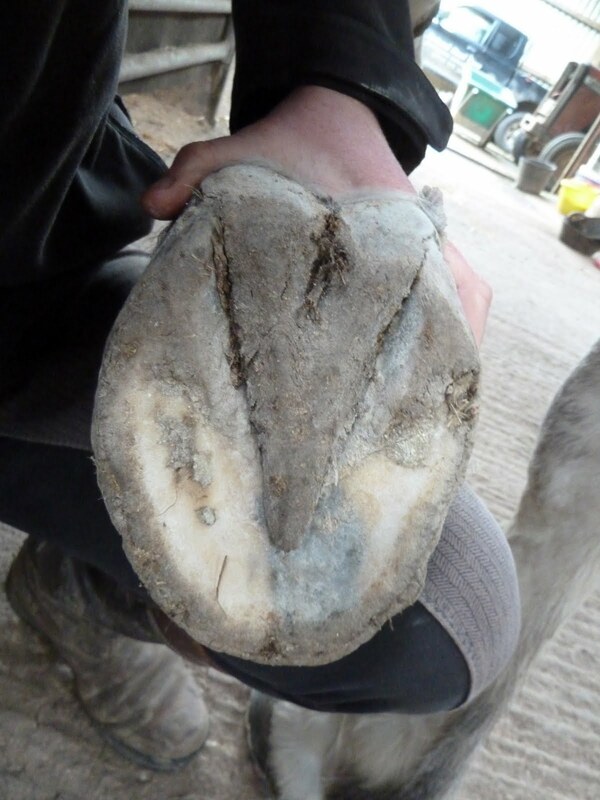 Its very common - in fact its almost invariable - that once horses are at Rockley they grow a hoof capsule with improved horn quality and a better angle. This can be partly due to shoes coming off and increased movement but there's also an effect of the different mineral levels. You've already seen that loads of times in hoof updates like this so I thought I'd show you something else for a change. One of the rehab horses arrived at Rockley with several sarcoids, including this, which was the worst. After 4 weeks, during which the biggest change was in the mineral levels in the horse's diet, the sarcoid looked like this and the owner couldn't find several of the smaller ones at all when she tried to locate them. This isn't the first horse whose sarcoids have improved and - along with better hooves - its something that is not unexpected with a better mineral balance. Of course, I am not saying that balancing minerals will cure sarcoids - they are a complex condition - but it is true that low levels of some minerals can affect a horse's immune system and this can allow problems like sarcoids to become aggravated. 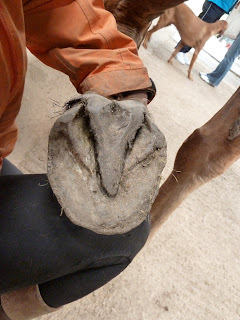 Equally, minerals alone won't give a horse perfect hooves, but you can pretty much guarantee that without adequate minerals a horse WILL have hoof problems. So what about myths and marketing? 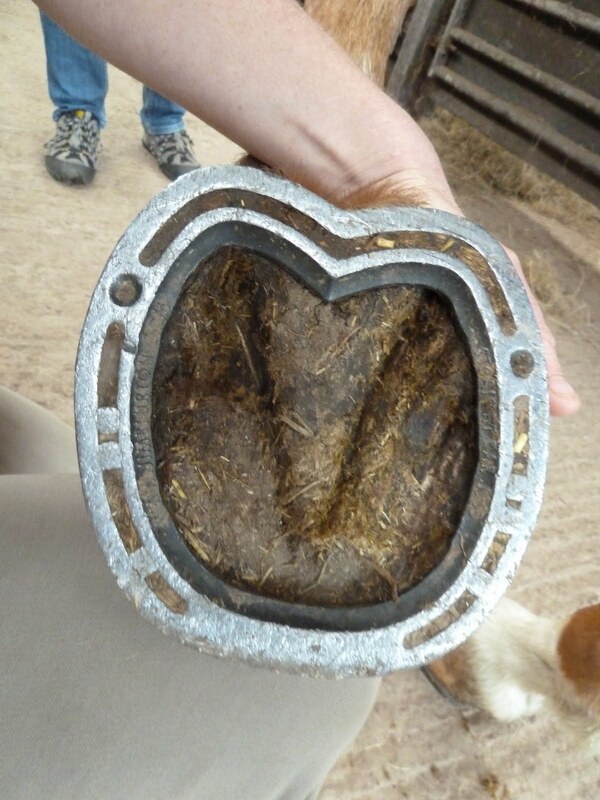 Despite the dreams of retailers and feed and supplement manufacturers (and of trimmers, owners and farriers who would all of us like nothing better than an all round supplement which could deliver perfect hooves every time! ), its not possible to make a mineral supplement that will provide everything that every horse needs. If you look at how horses live and eat, you can see why. Unlike dogs or cats, the majority of a horse's diet is forage - in practical terms that means grass, hay and haylage from where the horse lives. The mineral levels in forage vary not just across the country but even from field to field. A sample taken from one of my fields will show good levels of selenium and copper, for example, but the field next door will have low levels. This would have worked well when horses roamed vast areas, of course - horses, like most animals, seem to have evolved to juggle minerals to a certain extent - none of us, and probably none of our horses, eat a diet which is perfectly balanced every day, but if we eat sensibly then we achieve balance over a period of time. However, often in domestication, our horses don't have the luxury of browsing and grazing such biodiversity. Add to fewer plant species farming practices which can make minerals less available, and you have a potential problem. You'll see lots of mineral supplements and feeds claiming to be "fully balanced" but as a claim for horses nationwide thats impossible - if you perfectly balance the minerals for a horse in one place they are unlikely to be balanced for a horse even 20 miles up the road, let alone in an area with different soil, different geology, different climate. The basic supplement we talked about in Feet First will do a decent job in many areas, and has the enormous virtue of also being safe BUT its not a panacea (because that doesn't exist, see above...!). Safe is critical, though, because the risky part about minerals is that too much can be as bad as - or even worse than - not enough. As with so many things, there are no one-size-fits-all easy answers. Its not rocket science either but at the moment your best bet, if you have hoof problems, particularly footinesss, and if a basic supplement is not working for you, will be to take a closer look at mineral levels in your forage and - if possible - balance those levels to your horse's requirements. It sounds complicated, but its something that has been good farming practice for a long while and the information and resources are out there.